November - May, the museum is open Tuesday through Sunday, 10 am to 5 pm. The Museum is closed on January 1, Easter Sunday, Thanksgiving, and December 25. From May through October, the museum is open each day from 10am-5pm. There is no charge for New Mexico education groups visiting the museum with their instructor and/or adult chaperones. Out of state education groups numbering 10 or greater qualify for a group rate of $8 per person, payable in one transaction. Youth 16 and under are free. Please note that your group must number 10 or more to qualify for the group rate. Schedule your school/youth group visit by contacting: MIAC.Education@state.nm.us. Schedule your college/adult group visit by contacting: andrew.albertson@state.nm.us. To become a member, join the Museum of New Mexico Foundation. 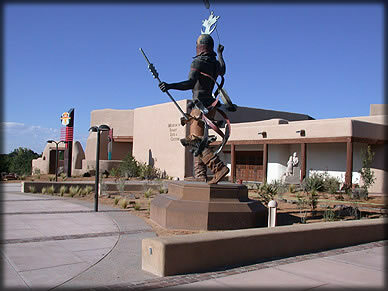 Membership affords entry to the Museum of Indian Arts & Culture, Museum of International Folk Art, New Mexico Museum of Art, New Mexico History Museum/Palace of the Governors and six historic monuments. Membership support enables these cultural institutions to present a variety of world-class exhibitions, public programs, and other cultural offerings to you and the more than 335,000 visitors each year. With one membership, you receive benefits to all four museums and six monuments for one year including unlimited, free admission; ten percent shops discount in-store and at newmexicocreates.org and worldfolkart.org; subscription to El Palacio magazine; invitations to members-only events and more. To learn more or to join click here: http://www.museumfoundation.org/membership. If you're on the move and visiting multiple sites/museums within New Mexico, you might consider our Culture Pass for $30. It affords admission to 15 State Museums and Historic Sites. To learn more about the Culture Pass, CLICK HERE.